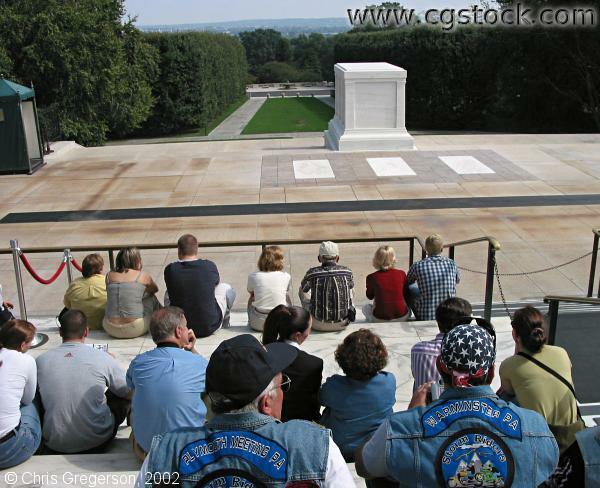 This is the Tomb of the Unknowns on the grounds of Arlington National Cemetery in Virginia. There is a sentinel here (out of frame in this shot) from the Third U.S. Infantry. The people seated are waiting to watch the changing of the guard. The marble tomb holds the remains of an unknown soldier from World War I. Under the white slabs in front of it are unknown dead from World War II, Korea and Vietnam.